Lately, every movie seems to be a sequel or reboot — but it doesn't stop there. Because the movie industry is increasingly dependent on creating franchises, we're seeing some bastardized forms, that are just designed to keep franchises alive. Here are six newfangled types of movies that we're already tired of. There's nothing wrong with a spin-off, per se. Some great movies have spawned decent spin-offs. But a "sidequel" is a spinoff that doesn't have enough confidence to cut the cord and live or die on its own. A "sidequel" is a movie that's both prequel and sequel, showing what happened before and after the earlier, superior film, and it often engages in a lot of pointless connecting-the-dots action. Plus because these movies seldom feature the actual stars of the earlier films, there's often some hilarious "French farce" staging. Leonidas? You just missed him, he was here a second ago. Jason Bourne? He just went that way — if you hurry, you might catch up with him. This is the problem with the "mega franchise" concept — if you're not careful, you wind up with individual installments that don't stand on their own, because they're too busy trying to set up other potential franchises. Iron Man 2 spends so much time trying to establish SHIELD and hint at Thor and other future movies, it loses some crucial momentum in the second act. 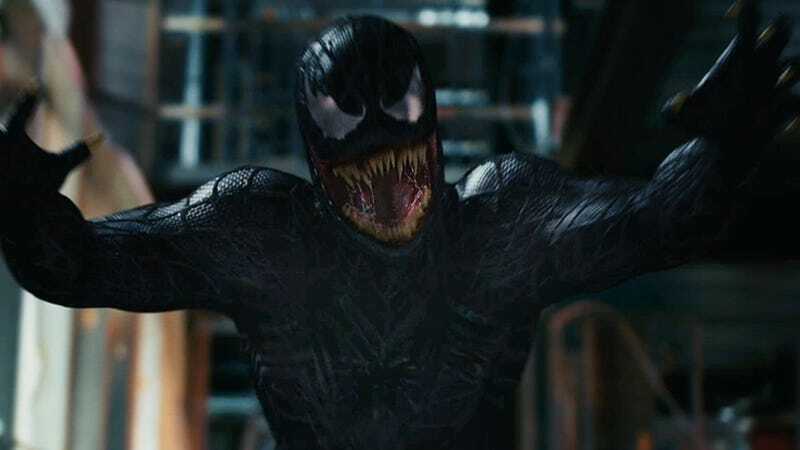 And two different Spider-Man sequels have been plagued by this "backdoor pilot" syndrome: Spidey 3 was derailed partly by the need to set up a Venom spinoff, whereas Amazing Spider-Man 2 became bloated due to the need to lay the groundwork for Sinister Six (and possibly a Felicia Hardy vehicle.) The first Wolverine movie tried, ineptly, to set up a Deadpool spin-off and introduce Gambit, whereas the most recent X-Men film may have been trying (more successfully) to lay the groundwork for a Quicksilver franchise of some sort. Anyway, when a film starts getting overstuffed with extraneous crap in the hopes of setting up a slew of lucrative spin-offs, then it often gunks up the works. Even though I remain optimistic about DC's movie plans, it's worrying that Batman v. Superman is apparently going to introduce a billion surplus heroes, so they can spin off into their own vehicles. But we'll have to wait and see! These are basically remakes that capitalize on a popular (or beloved) title while tearing out everything that originally worked about it. In the case of the recent RoboCop, it could have been a pretty decent film on its own merits, but it suffered by the forced comparison to the 1987 classic — this is one case where a film might have done better if they hadn't even called it a remake. In other cases, though, the new versions couldn't stand on their own no matter what they tried, because their only sparks of brilliance come from the earlier versions. Why bother to remake Death Race 2000 without the basic concept of the cross-country race where you run over innocent people? Why remake Invasion of the Body Snatchers without, you know, Body Snatchers? And so on. What's the point in using the name if you're not going to use the actual concept? This is probably justified in some cases (both the final Harry Potter book and the third Hunger Games book are pretty massive and would be hard to fit into a single film) but this trend has clearly gotten out of hand. As evidenced by the Hobbit trilogy. Also, the Fantastic Beasts trilogy, which is at least loosely based on one slim book — but possibly with a ton of new material from J.K. Rowling, so we'll see how that goes. Having sat through both Breaking Dawn films, I'm not convinced Bella and Edward's wedding and honeymoon needed that much screen time. It's hard not to suspect, after a while, that this "adaptation sprawl" is driven by the need to keep a cash cow going as long as possible, rather than the needs of the story. How did the creepy doll that you only glimpsed in The Conjuring get possessed by demons? Turns out the answer is, "because demons." What happened to those Norwegians in John Carpenter's The Thing? Exactly what you think happened to them. How did that huckster become enshrined as the Wizard of Oz? How did the Xenomorph get its groove? Etc. etc. When there's no room to do another sequel, the go-to move is to make a prequel — but then you have to try and "explain" something that was probably explained more or less satisfactorily already. Reportedly, The Huntsman will explain how Ravenna and the Huntsman knew each other, which is pretty adequately covered in Snow White and the Huntsman. Examples: The Star Trek films, the X-Men films, the James Bond films, the Terminator films. Nobody does hard reboots any more — now it's all about soft reboots. Basically, bring in a whole new cast, except for one popular hold-over. In the case of the X-Men films, we're ending up with a situation where Hugh Jackman will be the only castmember from the original series in X-Men: Apocalypse, but we went through a more circuitous route to get there. The upcoming Terminator: Genisys looks like it'll follow the same playbook as the 2009 Star Trek and the first few Daniel Craig James Bond films: We'll have Arnold Schwarzenegger reprising his iconic role, but with a whole new cast and a rebooted continuity. Honestly, the "soft reboot" isn't as annoying as the sidequel or the spinoff backdoor pilot, in terms of its kludgey mechanics. (Edited to add: In fact, Casino Royale, Skyfall, the first Abrams Star Trek and X-Men First Class and Days of Future Past are all pretty excellent.) But it's another way of trying to extend a series past its expiration date. And the continuity issues tend to get heinous — especially if the series tries to "fix" past mistakes, or overtly rehash past triumphs.